What products are included in the Turbo product family? The Turbo product family includes Turbo™ Delphi®, Turbo™ Delphi for .NET, and Turbo™ C++. When the Turbos were originally released, the product line included both free Turbo Explorer and paid Turbo Professional editions as well as a Turbo C# product. The Turbo 2006 Professional products were discontinued after the release of the newer Delphi 2007 Professional, C++Builder 2007 Professional and RAD Studio 2007 Professional products. Who are the Turbo products designed for? The Turbo Explorers are fixed turn-key solutions for students, hobbyists, and non-professionals looking to quickly get started on Windows® and .NET programming with C++ or Delphi languages. Why is Borland releasing Turbos? The Turbos are being released from the Developer Tools Group as part of our long term commitment to the developer market. Will there be a Turbo Enterprise or Architect version? Enterprise and Architect Editions are offered in our multi-language CodeGear RAD Studio line. We do not have plans at this time to offer Enterprise and Architect levels of the Turbos. How can I get my hands on the Turbos? Turbo Explorer editions are available for download from http://cc.codegear.com/free/turbo and http://www.turboexplorer.com. Is there anything I can do to help promote the new Turbo products? Everything. Go to places where non-programmers hang out. Write articles or blogs about programming for beginners, kids, teenagers, scientists, etc. Spread the word to colleges, professors, high school computer teachers. Build your own viral videos and put them up on YouTube and other video sites. Burn CDs containing the Explorer download and take them to your local users groups. When were the Turbo products released? The products were released in September 2006. Can I have more than one Turbo installed on my PC at once? Only one Turbo product can be installed on a PC or VM at a time. In addition, the Turbo products cannot be installed on a machine that has the Borland Developer Studio 2006 installed. Can I use Delphi and C++Builder VCL components and controls? The Turbo Explorer editions cannot use 3rd party components or plug-ins. Upgrade to the Professional editions of Delphi, C++Builder or CodeGear RAD Studio to use other VCL custom controls, components and experts, including those from 3rd party vendors. What are the differences between the Turbo Explorers and the Professional editions of Delphi, C++Builder and CodeGear RAD Studio? The main difference is that the Explorer edition comes with a fixed set of over 200 software components for building hundreds of different types of applications limited only by your imagination. The Professional editions include additional components, and most importantly the Professional edition allows you to customize the included components, create your own from scratch, and add any of thousands of available 3rd party custom controls and components. The Professional edition also allows you to add any of the hundreds of available custom 3rd party IDE plug-ins to extend the capabilities and features of the IDE. Powerful Code Editor speeds coding with syntax highlighting, Live Templates, Code Completion, refactorings, integrated debugging and more. Is the VCL component library included? Yes. The Turbo Explorers include a comprehensive set of VCL components. Is VCL source code included? Yes. Having access to the VCL source code is a great instructional resource for understanding how to use the VCL. Yes. The same level of ECO functionality in BDS Professional is included in the Turbo Delphi for .NET with persistence to XML files. ECO is built using the .NET Framework and is not available in the Win32® products. Yes. UML design functionality is included in the Turbo Delphi and Turbo Delphi for .NET. UML design functionality is not currently available for any of the C++ products. Can I develop commercial applications with the free Turbo Explorer edition? Yes. There are no restrictions commercial use of the Turbo Explorers. Do the Turbo editions contain the update packs and hot fixes? Yes. The Turbos are based on BDS 2006 Update 2 and several of the hotfixes. Will Turbo C++ Explorer be able to compile Delphi code? Yes – Turbo C++ has the same compiler capabilities as C++Builder in BDS 2006 Professional. Will additional hot fixes and update packs be compatible with the all Turbo editions? Yes. Since the Turbo products and the BDS are binary compatible, hot fixes and updates designed for BDS will be compatible with all the Turbo versions. Does Turbo Delphi (for Win32) require the .NET Framework to be installed? Yes. Some of the functionality in the IDE is managed code that requires the .NET Framework. 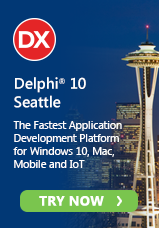 However, the apps you build in Turbo Delphi (Win32) do not need the .NET Framework. Is the Delphi command line compiler included in the Turbo Explorer editions? No. It’s available in Delphi Professional edition and above. Will the current Quality Central client work in Turbo? Yes. Bug reports and feature requests will still be in the Delphi, Delphi.NET or C++Builder projects in QualityCentral (qc.borland.com). Turbo Assembler is built into Turbo Delphi and Turbo C++. Copyright © 2008 CodeGear™. All rights reserved. All Borland brand and product names are service marks, trademarks or registered trademarks of Borland Software Corporation in the United States and other countries. All other marks are the property of their respective owners. How do I register the program I received with my Problem solving with c++ seventh edition? please, where's the dbwebdatasource component? and where the dbweb palette is? after installation, just run the .net framework 1.1 from the disc directly and it should be okay. if it still fails, download the .net framework 1.1 from microsoft's website and install that.